Print your logo onto these custom printed borosilicate bottles in sleeves (600ml) or one of our other innovative borosilicate glass water bottles and use them in your next marketing campaign as a unique giveaway item. These Deluxe Glass bottles with protective sleeve come at 600ml capacity and are made of borosilicate glass (which doesn't break easily and is the latest in healthy drinkware) drink bottle with a screw top lid. It comes in a silicon casing that add both colour and ease when picking it up. The Glass used is exceptionally strong and light weight making it a perfect Eco-friendly drink bottle for staff or clients! Colours: White, Yellow, Orange, Pink, Red, Bright Green, Light Blue, Royal Blue, Purple, Black. Screen Print: 120mm x 50mm (one colour) extra $1.10 each. Laser Engraving: 35mm circle (lid) extra 80c each. Prices shown include a 1 colour print in 1 position only. Other innovative corporate gift ideas that could be suitable to create brand awareness include these cheap promotional Glass Drink Bottles w Sleeves (600mL ), quirky advertising gifts such as these Cool Crush Freeze BPA Drink Bottles (600 ml) or how about using one of our more bespoke custom made products such as these great quality Mecca Glass Bottles With Neoprene Sleeve (570ml)? Custom brand these borosilicate bottles in sleeves (600ml) or one of our best-selling promotional drink bottles»borosilicate glass water bottles with your company logo! Your promotional borosilicate bottles in sleeves (600ml) can be silk screen printed in 1 or more colours. Costs shown include a 1 colour logo print on your custom branded borosilicate bottles in sleeves (600ml). We can print more than 1 colour, however it incurs extra costs. We can achieve a perfect PMS colour match for the print. Engraving your logo on the promotional borosilicate bottles in sleeves (600ml) is usually done by Laser engraving, where the laser removes a thin layer of the metal surface. Your logo becomes part of the borosilicate bottles in sleeves (600ml) and is impossible to remove. Sometimes the engraved effect will be a different metal colour to the outside metal coating of your product. We can also engrave wood or plastic. Engraving is usually a more expensive branding method. Personalise your borosilicate bottles in sleeves (600ml) or custom design borosilicate glass water bottles for your marketing campaign. How can these unique promotional borosilicate bottles in sleeves (600ml) or our personalised borosilicate glass water bottles fit in with your marketing strategy and help you maximise your brand exposure? Our custom made Borosilicate Bottles in Sleeves (600ml) can be produced from a minimum quantity of 50 pieces. 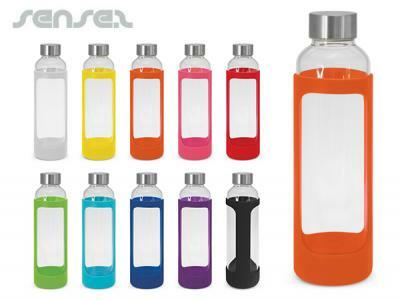 We can have your logo branded on these corporate Borosilicate Bottles in Sleeves (600ml). A setup fee of AU$160.00 will apply to make the film.